Mission Madness: How Effective is the Big Meeting Format for Outreach? It’s a scene that seems to play out every time SFMTA holds one of these large community meetings about whatever fill-in-the-blank project. Someone will take over the mic, break the rules, and whip the room into a lather. But Monday night’s meeting was especially bad. It must have been 85 degrees at the Mission Cultural Center for Latino Arts. That’s probably because 200 people crammed into the space to support–and bemoan–the SFMTA’s transit-only “red carpet” lanes installed last March on Mission. Or maybe the heat was from the smoldering rage, seemingly intensified by the thudding noise from a dance class above that vibrated throughout the meeting room, which is also an art space. That said, before the raucous meeting officially got underway, Streetsblog was able to talk one-on-one with a few of the attendees and presenters. Blowback continues to SFMTA’s red-painted, transit-only lanes on Mission. Photo: Streetsblog. StopSFMTA. The agency is out of control. Just when you thought it couldn’t get any worse SFMTA unleashes a Major New Crisis on Mission Street. They are coming for your street next! Confusing everyone with meaningless signs and paint…stop SFMTA – tell city Hall you have had ENUF. “Business is down 30 to 60 percent,” she said, but couldn’t provide evidence for the claim. This reflects a common assertion–usually unsubstantiated–from businesses when streets are given transit enhancements or bike lanes. Sam Murphy is a photographer who lives in Bernal Heights and who came to the meeting with her bike helmet in hand. “Mission is safer,” she said. “I use it on my route from home to Noe.” She said the bus lanes–and reduction in auto lanes–makes it safer for cyclists too. “You don’t have buses weaving in and out” to get to the curb, she said. She came to the meeting to hear what the proposed “tweaks” to the lanes were all about. He also asked the audience to disagree without “being disagreeable.” But even that statement was met with a cat call. Reiskin pointed out that Mission was identified as a “high injury corridor” and that the new bus lanes have already sped up travel times and reduced the number of injuries. 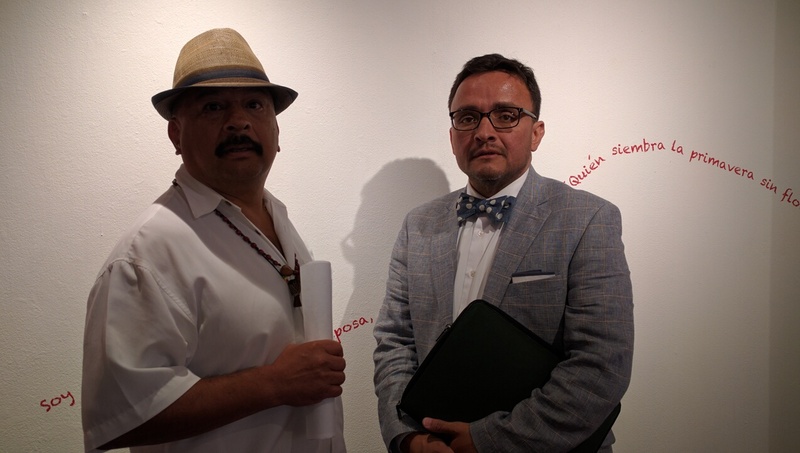 Roberto Hernandez and Supervisor David Campos before the start of the Mission meeting. Photo: Streetsblog. But for every objection, there were speakers in support, including from advocacy groups such as the San Francisco Transit Riders and Walk San Francisco. “The transit lanes are making Muni better for more people and resulting in fewer crashes,” said Cathy DeLuca, Walk San Francisco’s Program and Policy Manager, speaking over boos and groans from the audience. SFMTA also plans to conduct “merchant walks in the project area, and a survey of residents and visitors on Mission Street” to get a more comprehensive picture of residents’ concerns. Which begs the question: maybe it’s time to abandon the “big meeting” strategy of outreach altogether. 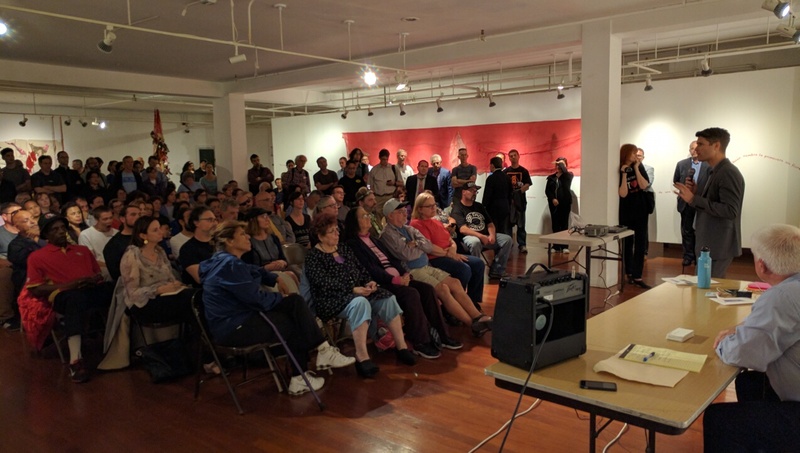 After a similar meeting about transit changes on Taraval, Supervisor Katy Tang opted to hold smaller group meetings to hear reasoned comments and less shouting. And BART is already taking a different strategy: setting up outreach tables in train stations rather than community centers. And maybe that’s the way to go. Because with all the heat, shouting and anger, it’s unclear exactly what this meeting accomplished that can’t be done far more effectively by other means. 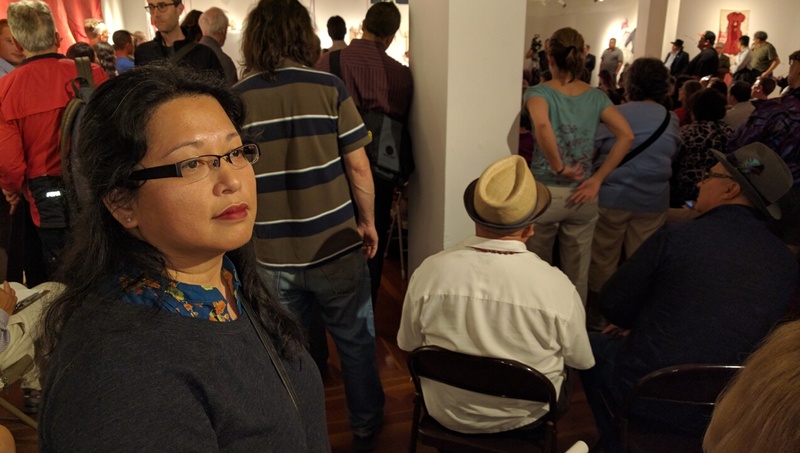 Christina Castro, who spoke in favor of the lanes for the San Francisco Transit Riders, catches her breath at the back of the sweltering room full of angry people Monday night. Photo: Streetsblog. The article written today in the Examiner http://www.sfexaminer.com/sfmta-may-amend-mission-red-carpet-bus-lanes/ suggests that the SFMTA may eliminate the turn restricts that appears to cause the greatest amount of angst among drivers who commented at the community meeting. The SFMTA has done this before at at least two locations that I know of: On Divisidero where a planned no turn restriction at Haight St. was proposed to maintain traffic flow after the Scott Street bicycle lanes are implemented – a merchant group complained and the restriction has been removed, and on Powell Street after merchants complained when private cars could no longer drive between O’Farrell and Post Streets. In each case, the people who suffer the most from these changes are transit riders, as turning cars off a corridor cause the most significant delays to transit vehicles which affect reliability, predictability, and speed. In addition, there would be a greater statistical risk that someone walking would get injured or killed by a left turning car, as those are the most deadly types of crashes in the city. At the public meeting last night, there was one notable constituency that was largely missing from the public comments: The low income Latino residents who ride transit. We heard from Latino leaders in the Mission. We heard from drivers. We heard from a few business owners. We heard from transit and pedestrian activists. We also heard from some people who ride the bus, but they were mostly derided as “not from the Latino community”. 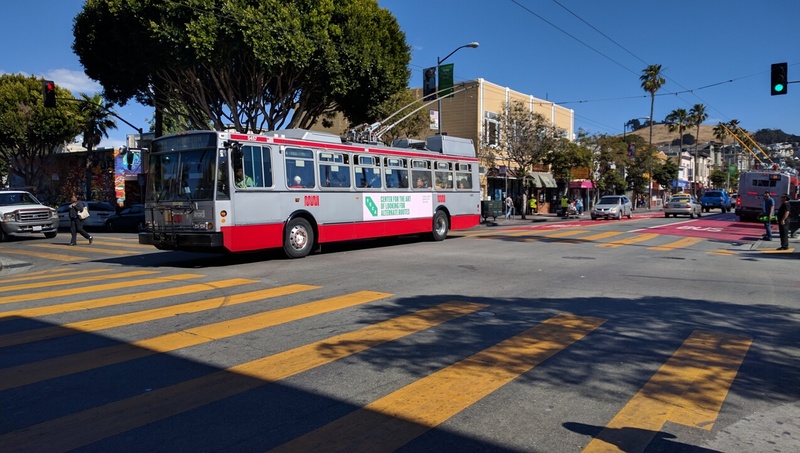 If SFMTA decides to remove the turn restrictions and make changes that will negatively affect these riders, then the whole reason to do outreach to bus riders in the first place to ask them what they want will be shown as moot, because clearly, they don’t matter in the political calculus that goes on in this city. It felt more like a Donald Trump rally than a public meeting to me. There was an acrimonious and strident tone and what seemed to almost be bullying of public servants. I felt ashamed to be a San Franciscan. It’s disheartening to see such divisiveness and rampant defense of the automobile, with an almost mob-like dismissal of other viewpoints. I find it ironic that it took me a good hour (on Muni – not on Mission Street) to get from work to the meeting. I arrived late but over an hour before it ended. Perhaps due to the speakers who exceeded their 2 minute allotments many couldn’t speak, myself included. Sounds like those against the bus lanes were ordinary residents and business owners in the area. While those in favor of the bus lanes were members of activist and advocacy groups. So another problem with the meeting is that some were present for ideological reasons and not necessarily because they live there or are personally affected by the changes. Perhaps we should listen more to the real ordinary people who show up rather than the rebels with a cause? That said, I don’t like to see anyone playing a race card, and those who tried to make this a rallying call for Hispanics are culpable for the chaos as well. Did anybody ask Basem El-Kurd where their delivery trucks were parking before? As I understand it, very little parking was removed as a result of this project, so the argument that “parking is hard to come by” doesn’t seem relevant to the transit lane changes. I wasn’t expecting a coherent informed rebuttal from you and I was not disappointed. I think your observation applies to both camps (pro and con). A vocal opponent of Geary BRT, who is a merchant in the Richmond, spoke. Although I do not know where he lives, his presence and opposition seemed to be ideological. It is worth noting that some of the opposition was of a general anti-SFMTA variety. This agency is one of the local bogeymen, like the IRS is on a national level. Many of the anti-Mission red lanes statements seemed to be related to larger issues, like housing displacement and housing shortages – issues unrelated to this project or the SFMTA’s realm. ‘Almost bullying of public servants?’ Strike the ‘almost.’ It was bullying and demagoguery at its worst. And yes, shame on us. I wasn’t there and so can only base my remarks on what Roger wrote. His account appears to me to indicate that the anti-buslane speakers were not members of organized lobby groups but rather individual residents and business owners with a direct personal interest. Clearly that doesn’t apply to the “usual suspect” activist groups like SFBC, SFTR and WSF. But yes, I’m sure there were a few people from other neighborhoods speaking against the bus lanes because they fear the same treatment in their back yard unless people speak up. Thanks for making the point that no request for proof that businesses have suffered as a result of the very new installment. And if the data is there, was it just a glitch due to the installment period, adjustment period, fundamentally unresilient or shaky business practices? How about checking data, such as tax receipts as was done after changes at Fisherman’s Wharf? The underlying assumption of so many comments against was that good transit = gentrification, one person even declared outright that the SFMTA wants to speed gentrification of the Mission. The person next to me accused me of being on the payroll of SPUR when I nodded in agreement at a fact-based comment. I knew making public comment would be useless – and the high decibels and temp were unbearable – so I approached Campos and, in the presence of Reiskin, asked that he please clarify for his constituency that transit improvement does not drive gentrification; that the pain they’re feeling is real, that we’re in an economic system that is deeply unfair but evictions started long before the red lanes; that no one can argue that Chinatown is gentrified though it is transit-rich and will soon have a subway. His reply, ‘Why don’t *you* say that?’ I answered that no, he is their leader and he should lead. I tweeted it and walked away #Gobsmacked. Probably because they are working two jobs, taking care of kids or are not comfortable expressing themselves in English. If you want to hear from these folks, talk to the community organizations that provide services to them and address them en Español, por favor. Take a look at the board and staff of organizations like SFRTU, Walk SF and SFBC. They look like the board and staff of SalesForce – mostly white with a sprinkling of Asians, all middle-class and professional. It’s not surprising if they struggle to find a way to talk to low-income minorities, and that gives them a credibility problem, particularly in an area struggling with gentrification and displacement. David Heller, perhaps. He has been the singular force holding up Geary BRT for years. Yes, its possible in SF to have a single person delay plans that would benefit tens of thousands. San Francisco needs to solicit feedback and MOVE ON. We seem hell bent on getting everyone to agree, when there are large amount of people who will never agree to anything except what they want. 88% of people get to Mission Street without a car. It’s pretty clear the driving-focused opponents were not representative of the actual people on the street. I dare you to ride the 14 or 49 through the Mission. If you see more than a small sprinkling of “people who look like they work at Salesforce”, I’ll pay for the corrective lenses. If 88% of visitors to Mission Street were already not by car then clearly there was already adequate transit to this area, so why the change? Evidently you did not understand my point. It wasn’t that the people of the Mission are Anglo-Asian Yuppies, but rather that the representatives of SFBC, Walk SF and SFTRU are. And that addresses the points that gneiss and p_chazz made i.e. that it is those non-White low-income folks who were under-represented at the meeting. A useful rule of thumb is that the middle-class bike/walk/transit advocates are NEVER under-represented. I didn’t catch his name. After the meeting, I went up with him to talk. There was such divisiveness in the air I figured it was worth trying to find middle ground. I told him that I work on Geary and that it took me an hour, traveling by Muni, to make it to the meeting. When he recognized that I was supportive of BRT on Geary, he asked me: “are you a merchant? are you a homeowner?” He then ended the conversation. Diatribe has (too often) replaced dialogue. OK, so what we really know here is that two people from a neighborhood 3 or 4 miles away, who have not been affected by this change, disagreed with each other? Bus bulbs are constructed at existing bus stops, where parking is already prohibited. Have you ever ridden the 14 or 49? They used to take 30 minutes just to get from Cesar Chavez to 14th. ENUF and CAN were there in spades, and the Monarch of the Mission represents a group as well. Temporarily stopping in a prohibited zone to set down a transit rider is generally not considered a hanging offense, but does free up parking elsewhere. More generally any build-out that confiscates available space for cars can reasonably be expected to increase congestion, stress and risk. Yes, and of those 30 minutes, about 25 were stopping to pick up and set down swarms of people. The actual elapsed time of the journey was trivial compared with dealing with the dwell time at every stop due to over-crowding. We need to get those folks onto under-ground transit. Citations needed. Your plucked acronyms and regal references do not compute. Sorry, my bad, I should have asked for RELEVANT citations. Yeah. I was wondering, is he clueless? Or just a manipulative creep? Depends on who you talk to. A city planner I spoke to last night said that Campos has actively blocked crucial projects. Near as I can tell, Campos does a lot of pandering. They all have to to some extent, but some pollies manage to sneak in some decent policy in, as well. We’ll never be able to afford a subway, but BRT can be up and runnning in a couple years. SFMTA completely mismanaged this meeting. They didn’t switch mics off after 2 minutes, they tolerated rowdiness and disruptions, and just stood by and watched the meeting dissolve into chaos. At one point I went up and told the 2 MTA staff, sitting passively at a table in the front while the audience was shouting everything from false data to shut up and sit down, to control the meeting. It’s your meeting. You have to control it. Of course they just looked at me like I was crazy for even asking. All this time Reiskin was also just leaning against the wall seemingly amused by the boisterous chaos. MTA needs to do better, rather than dispute the value of meeting that they let explode. I’m afraid you’re mistaken regarding my proximity to this change and to its effect, as well. Will the SFMTA Board Demand Complete Protected Bike Lanes on Polk Street?